Hello, hello, hello! Today's project was inspired by this month's tag by Tim Holtz. I used one of my newest stamp sets by Mr Holtz, Crazy Dogs. I'm not sure why I didn't order the Mini Cats & Dogs set at the same time. I think I need to do some more shopping! Thanks for stopping by! Great minds!!!! LOVE your pup take!!! 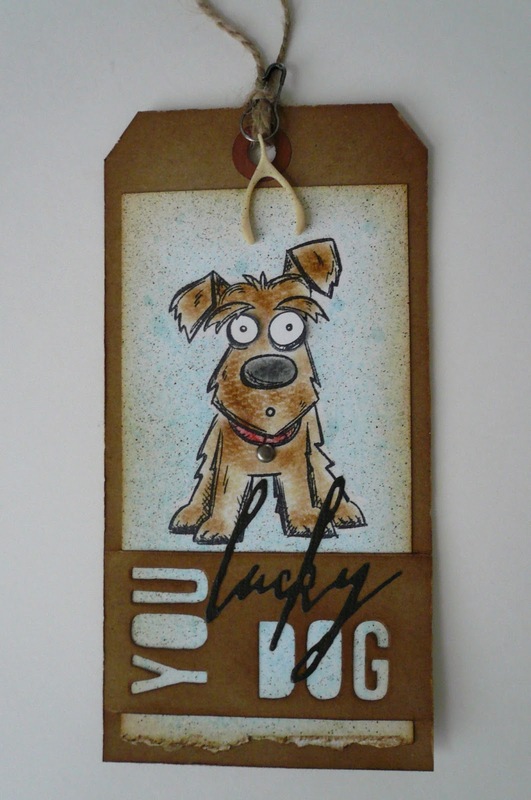 Huge congratulations on your win, I love that you used the Crazy Dog, your tag is brilliant! Congrats on your win!! Great tag! congrats on winning at Tim's! Gorgeous tag! Congrats on the win! Congratulations on your win! Your tag is fabulous. The sentiment arrangement and wishbone are wonderful details. HI Deb, your tag is so adorable!! Congrats on the win!! Great tag...love those dogs & you are a lucky dog...LOL!